This is a rectangular flange Otto Pietsch Dye Works porcelain sign. This particular Otto Pietsch Dye Works sign is black with white text. 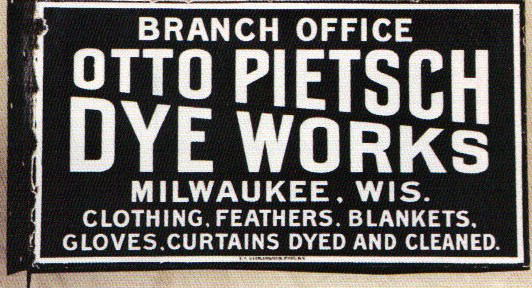 It reads, “Branch Office, Otto Pietsch Dye Works, Milwaukee, Wis., Clothing, Feathers, Blankets, Gloves, Curtains Dyed and Cleaned” and features a thin white border.